Several studies suggest that most school-age children are poorly informed about cancer risk factors. This study examines the effectiveness of the ‘Be smart against cancer’ (BSAC) program in promoting cancer awareness and intentions to engage in health-promoting behavior. 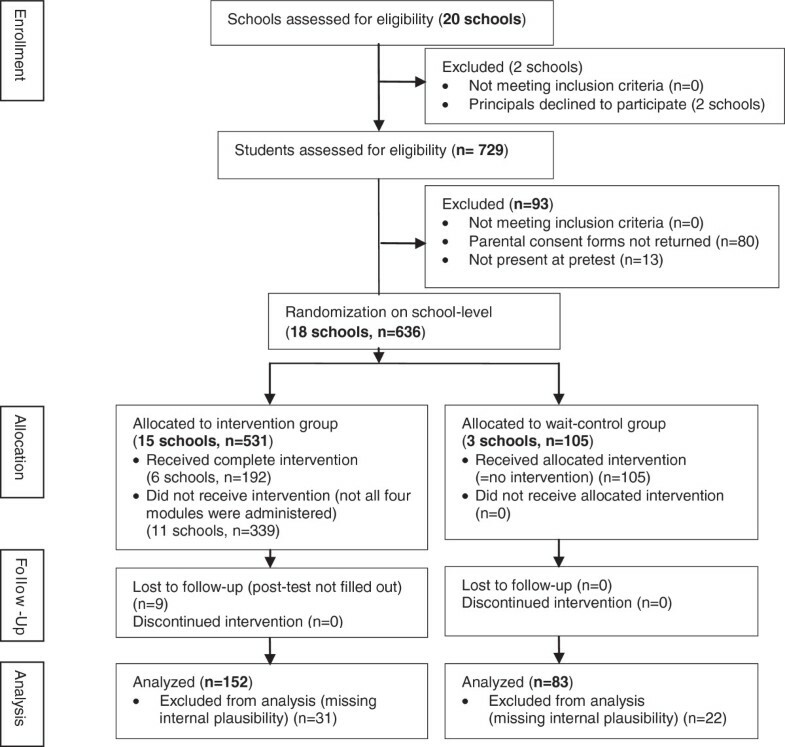 235 seventh-grade students were randomized to either the intervention (N = 152) or the wait-control group (N = 83). The intervention included the modules: “What is cancer?,” “Sun protection,” “Non smoking,” and “Physical activity, Healthy nutrition, and Limited alcohol consumption.” Outcomes measured at baseline and at the end of the one week BSAC program included knowledge of cancer and its behavioral risk factors, health-promoting intentions, and reported risk behavior. BSAC was effective in increasing knowledge about cancer and risk factors for cancer (p < .001), as well as in increasing intentions to engage in health-promoting behavior (p < .001), independent of a student’s risk profile. Knowledge did not serve as a mediator for intention building. The BSAC is an effective school-based program for raising awareness of cancer, associated risk factors and intentions to engage in cancer-preventive behavior. The results indicate that the effectiveness of BSAC is independent of a student’s risk profile. Therefore, it holds considerable promise as a broadly applicable program to raise cancer awareness and promote healthy behavior intentions. Although the overall incidence of cancer is rising, the World Health Organization (WHO) estimates that one third of all newly diagnosed cancers could be prevented if behavioral factors such as smoking, limited physical activity, unbalanced diet, alcohol consumption and excessive exposure to sunlight were changed [1–6]. Behaviors associated with increased cancer risk such as smoking and alcohol consumption emerge during childhood and adolescence [7–9] and once established, they contribute to cancer occurring later in life [10, 11]. U.S. data from the Youth Risk Behavior Surveillance 2009 (YRBS) as well as data from the German Health Interview and Examination Survey for Children and Adolescents (KiGGS) and other European studies indicate that about 20% of high school students smoke cigarettes on a regular basis. An even higher proportion of students, 30% - 60%, drink alcohol regularly. Furthermore, 80% of high school students do not exercise regularly, and 10% are obese [12–16]. Different concepts of cancer education programs for adults which successfully increase knowledge and awareness have been reported [17–19]. Considering that changing extreme and stable risk behaviors is a difficult task, interventions would be most effective when directed at children and adolescents before they began to experiment with risk behavior [20, 21]. Several studies suggest that a majority of school age children are poorly informed about cancer as well as preventive behavior [22–24]. The National Cancer Institute identified schools as having a central role in cancer prevention education ; school programs, however, often focus on only one behavioral risk factor [26–29]. We, therefore, designed the ‘Be smart against cancer’ (BSAC) program to target multiple risk factors for adult-onset cancer simultaneously by encouraging healthy lifestyles in a format especially designed for schools. In a one-week curriculum, the topics “What is cancer,” “Non smoking,” “Sun protection,” and “Physical activity, Healthy nutrition and Limited alcohol consumption” are covered in a practical manner for seventh-grade students. This age was chosen for the intervention because it is a common time for the initiation of risk behaviors [30, 31], and these topics fit into the 7th grade curriculum . The aim of this study, which was run under the auspices of the University Cancer Center Dresden (UCC), a Comprehensive Cancer Center in the National Program of German Cancer Aid  was to promote the awareness of cancer-related risk factors and to increase the intention to engage in protective behavior as a predictor of actual behavior [34, 35]. The effectiveness of BSAC in improving knowledge about cancer and associated behavioral risk factors and in promoting intentions to engage in protective behavior was tested in a randomized wait-control group trial including each student’s cancer risk profile as a variable in the analysis. Additionally, the capacity of knowledge gain as a mediator for a change of intentions was investigated. The study is based on an experimental pre-post design including an intervention group (IG) and a control group (CG). The IG received the BSAC curriculum during the school year 2008/2009 and the CG received no intervention. CG and IG were built on school-level. Effects were measured within a pre-post comparison of IG and CG. In the IG, the post-test was given at the last day of the project, and in the CG four to five days after the pre-test. BSAC was implemented in the CG the following school year without any further evaluation. Since a low socio-economic status (SES) is linked to high levels of health-related risk behaviors [8, 36, 37], BSAC was implemented in vocationally-oriented secondary schools. Of vocational schools in Saxony (published online on http://www.schuldatenbank.sachsen.de), 20 were randomly selected using a random number table. Study personnel contacted the principals of the schools, inviting them to take part in the BSAC project. Eighteen agreed, of which three schools were assigned to the CG, again using a random number table. Modified CONSORT study flow diagram of study enrollment, allocation and analysis. To guarantee anonymity, all participating students used an individual four-figure code on each questionnaire for both the pre- and post-BSAC test. Due to the lack of an already existing instrument to assess knowledge about cancer and associated behavioral risk factors, the BSAC questionnaire was developed. Based on Danaei et al. , relevant behavioral risk factors were chosen and a set of items (actual behavior and behavioral intentions) was developed. Experts in cancer and risk behavior revised the BSAC questionnaire, which was pilot-tested in 25 7th-grade students and modified thereafter. In addition to age and gender, the questionnaire contained questions regarding health-related behavior (BEH) in 6 areas: engaging in physical activity; applying sun lotion in the summer; smoking cigarettes; eating fruits and vegetables; eating sweets and drinking soft drinks; drinking alcohol, using a three or four-point response scale. There were also multiple-choice items with three response options testing knowledge reflecting the contents of the BSAC curriculum (KNO; 21 items), as well as intention to engage in protective behavior was assessed (INT; 6 items; eg: “in the next months, I intend to be physically active for at least 30 minutes,” “apply sun lotion,” “not smoke/smoke less,” “eat more fruits and vegetables,” “eat no/less sweets and drink no/less soft drinks,” and “drink no/less alcohol”), using a four-point response scale (Table 1). Have you been smoking within the last three months? I intend to smoke less/stop smoking. Have you been drinking alcohol within the last three months? I intend to drink less/not at all. How often are you physically active in your leisure time? How often should a person be physically active for at least 30 minutes? I intend to be physically active each day for at least 30 minutes. Do you use sun lotion during the summer? What is an important factor for the development of skin cancer? A risk-score was created based upon a combination of the six adolescent risk behaviors investigated . Risk behaviors were dichotomized along guidelines for adolescent preventive care recommendations . Participants received a value of ‘1’ for each risk behavior present (i.e. no sports or physical activity in leisure times, no usage of sun lotion in the summer, any rate of smoking within the last three months, consumption of fruits/vegetables less than twice a week, daily consumption of sweets or soft drinks, any consumption of alcohol within the last three months). A value of ‘0’ indicated absence of a certain risk behavior. Values were summed up into a risk-score ranging from ‘0’ (no risk behavior present) to ‘6’ (all risk behaviors present). Correct responses to the knowledge items were summed up into a knowledge-score with a range from ‘0’ to ‘21’. The intention-score was also created by summing responses (range ‘0’ to ‘18’). Retest-reliability of the final scales was tested on the CG, and was satisfactory (risk-score: r = .92, p < .001; knowledge-score: r = .75, p < .001; intention-score: r = .74, p < .001). Internal consistency was α = .37 for the risk-scale, α = .35 for the knowledge-scale and α = .62 for the intention-scale. Correlations between the risk-score and the knowledge-score (r = −.12, p = .07), between the risk-score and the intention-score (r = −.47, p < .001), and between the knowledge-score and the intention-score (r < .01, p = .97) indicated discriminant validity of the scales. The BSAC curriculum is taught in one week and covers cancer and lifestyle factors associated with cancer risk reduction. The four modules are “What is cancer?,” “Non smoking,” “Sun protection,” and “Physical activity, Healthy nutrition and Limited alcohol consumption.” Each module requires one school day. A fifth day is used for recapitulating the project. All of the modules are organized similarly, with a short introduction, the specific content, and a rehearsal and summary of the module. Handouts are provided including the most important facts for the students. The BSAC curriculum is based on the Theory of Planned Behavior . All components and exercises are therefore designed to foster subjective norms, attitudes and perceived control over the actions concerning the specific preventive behaviors. Teaching materials were created by German Cancer Aid (Deutsche Krebshilfe e.V. ), and were enhanced by medical and educational experts working at the UCC. A variety of didactic methods, such as information, class discussion, role-play, quiz, pantomime, group-work and video clips were used to enhance the social-cognitive prerequisites of intentions as well as the transmission of knowledge. Concerning sun-protection, for instance, a class discussion about social norms (e.g. “My friends think being sun-tanned is pretty and healthy”) and attitudes (e.g. “I think sun-protection is important”) was conducted. A role-play supported perceived control over sun-protective behavior since practical training encourages the execution of actions. Students were informed about risks and use of the sun-light via a short video clip and tested on the benefits of different sun-protective behaviors via an interactive computer animation. Table 2 lists the topics and didactic methods used within each module. Short quiz: How long do we have to be physically active? Pantomime (3 students show forms of physical activity for the other students to guess): This is physical activity already? Handy exercises for in-classroom time: How can I be physically active in school? The BSAC teaching team consisted of members of the UCC and was trained by a teaching-experienced member of the UCC-Cancer Awareness Group. A manual provided all necessary facts about cancer and related risk factors and described the implementation of the curriculum. Group differences in continuous variables were assessed using t-Tests. Fisher’s exact test was used for dichotomous variables. One-way analysis of variance (ANOVA) was used to compare IG and CG at pre-test. Effects of the implemented curriculum regarding knowledge (pre-post difference) and intentions (pre-post difference) were tested using General linear mixed model (LMM) with experimental group (IG vs. CG) and risk-score (dichotomized into risk-score ≤ 1 vs. risk-score ≥ 2) as fixed effects, school as a random effect and pre-test scores as covariates. Pearsons r was calculated for the relationship between risk behavior, pre-test-scores and pre-post-differences of knowledge and intentions (IG sample only). A mediation analysis (SOBEL, Version 3.6) to predict the intention to engage in protective behavior was applied with the experimental group as independent variable and knowledge as a mediator . Differences in risk behavior at baseline between boys and girls of the IG were tested using a t-Test. Differences in knowledge gain and increase of intention were tested using LMM with gender and risk-score (dichotomized) as fixed effects, school as a random effect, and pre-test scores as covariates. Pearsons r was calculated for the relationship between age and risk behavior, gain in knowledge and increase of intention. Two-tailed tests were used and all statistics were performed using SPSS, Version 17.0 (SPSS Inc, Chicago, USA). The study was approved by the ethical board of the Technical University Dresden. In total 235 students provided complete data at baseline. The students in both the IG and CG had a mean age of 13 years (range 12 to 15 years), and 41% of the participants were female. Table 3 shows significant negative relationships between risk-score and intentions to engage in health promoting behavior at pre-test, between pre-test scores and differences each in knowledge and intentions. With regard to the six defined risk behaviors, 57% of the students in the CG and IG reported consumption of alcohol during the last three months, 25% stated (almost) daily consumption of sweets, and 14% reported not to be engaged in any physical activity in their leisure time (Table 4). Limited consumption of fruits and vegetables was reported by 17%, no application of sun lotion by 5%, and smoking by 6% of the students. Regarding the overall risk-score, 29% of the students showed a risk-score of zero, reporting no risk behavior at all. More than a third of the students (36%) reported one risk behavior only. No students reported five or more risk behaviors. *Regarding Demographic characteristics, Risk behavior and Risk-score only pretest data are analyzed. Both CG and IG showed relatively low mean risk-scores which did not differ significantly between groups (p = .12). There was no significant difference between girls and boys regarding the risk-score (t (216) = 0.006, p = .995), but a significant correlation between age and risk-score (r = .19, p < .01). Knowledge about cancer and associated behavioral risk factors was significantly increased by the curriculum as compared to the control group (p < .001; Table 4). While there was a slight decrease in the CG, the knowledge-score increased in the IG. There was neither a significant main effect for the risk-score (p = .76) nor a significant interaction effect between experimental group and risk-score regarding the gain in knowledge (p = .16). Knowledge at pre-test was a significant covariate (p < .001). Girls and boys in the IG did not differ significantly regarding the gain of knowledge (p = .97). As stated above, there was neither a significant main effect for the risk-score (p = .64) nor an interaction between gender and risk-score (p = .30), but knowledge at pre-test served as a significant covariate (p < .001). The correlation between age and the effectiveness regarding knowledge (r = −.04, p = .65) was not significant. At pre-test, the intention-score to engage in protective behavior differed between CG and IG (p = .04), showing a higher intention in the IG. Nevertheless, a significant intervention effect was observed for the intention-score (p < .01; Table 4) with an even higher level of intention for the IG at post-test. There was a significant main effect for the risk-score (p < .01) but no significant interaction between experimental group and risk-score regarding the promotion of intentions. The intention-score at pre-test served as a significant covariate (p < .001). Girls and boys in the IG did not differ significantly regarding the promotion of intention (p = .91). Again, there was a significant main effect for the risk-score (p < .01), but no interaction between gender and risk-score (p = .83). The intention-score at pre-test served as a significant covariate (p < .001). The correlation between age and effectiveness regarding intention (r = .03, p = .74) was not significant. The mediation analysis indicates a significant total effect of the experimental group on the promotion of intention (b (YX), p < .001), which is not mediated by the gain of knowledge (b (YM.X), p = .48), (Table 5). X = experimental group, M = pre-post difference of knowledge-score, Y = pre-post difference of intention-score. Certain risk behaviors established during adolescence, such as smoking, limited physical activity, unbalanced diet, alcohol consumption, and excessive exposure to sunlight, may have severe consequences in adulthood and may increase cancer risk . Although health education has led to increased public awareness, the knowledge about some risk factors and their consequences has yet to be established among young adolescents [22, 24]. Comparable to other programs, BSAC successfully implements knowledge about cancer and associated risk behaviors [17, 18, 23]. In addition to raising awareness, BSAC also effectively boosted health-promoting intentions. However, we found no mediating effect of knowledge on intentions. Other possible mediators such as social-cognitive determinants are discussed below. Since these variables have not been assessed, the discussion is speculative. According to the Theory of Planned Behavior, intentions for behavior change are influenced by social-cognitive determinants such as subjective norms, attitudes and perceived behavior control . As described above, these were addressed by the intervention. Other possible determinants of intention-building are described by the Health Action Process Approach (HAPA)  in which outcome expectancies and task self-efficacy play a crucial role in what people choose to do. Perceived risk may also stimulate intentions to adopt, initiate or maintain health behaviors. For Fischoff on the other hand, deciding to engage in health-promoting behavior depends on components as identifying alternative options and possible consequences . All these variables may have been affected by the BSAC curriculum and some constructs might even overlap, for example perceived behavior control and self-efficacy. Thus, the role-play about sun-protection, designed to support perceived control and positive attitudes towards sun-protection, may also boost student’s self-efficacy to perform the desired behavior or outcome expectancies towards the judgment of peers. In summary, the mediating mechanisms of successfully fostered health-promoting intentions by BSAC remain hypothetical. Good intentions cannot always be translated into corresponding actions, since various factors can be compromising . As described in the HAPA-model, action planning, self-efficacy as well as situational determinants, e.g. barriers may play an important role. For adolescent smokers, intentions were found to predict planning. On the other hand, planning serves as a predictor for actual behavior. One possibility to foster self-efficacy and to overcome barriers in school settings might be the initiation of class-level projects. A contest of projects with students working on a specific cancer related risk behavior such as smoking is currently conducted by the UCC Prevention Center. Almost one third of the participants reported no risk behavior at all and more than one third only one risk behavior. As described in other studies [11, 43] there is also a significant number of students showing more than one risk behavior, thereby suggesting a co-occurrence of risk behaviors. Similar to the results of the KiGGS and the YRBS, alcohol consumption during the last three months was the most frequently reported risk behavior [14, 15]. Alcohol consumption was followed by unhealthy eating habits and insufficient physical activity. However, only few students in this study engaged in risk behaviors, thus limiting the power of the program to reduce risk behaviors. The BSAC-program might therefore be successful at maintaining sufficient health behaviors rather than improving inadequate behaviors. The role of actual risk in the process of changing intentions is controversial. Some studies suggest that risk behavior undermines the commitment to behavior change . Data from the present study confirm a negative relationship between actual risk behavior and the willingness to engage in health-promoting behavior at baseline. Thus, students with a higher risk profile reported lower intentions to engage in health-promoting behavior. However, for students with low and high risk profiles, the program was equally able to raise the intentions as well as knowledge. These results suggest that the program is suitable for addressing both students with lower and higher risk profiles. Due to practical issues, there was no randomization procedure on the individual-level. Experimental groups are based on natural groups (class-level). Therefore, the influence of confounding factors not assessed cannot be ruled out. Furthermore, self-reports are prone to several kinds of biases, such as social desirability . No power calculation has been conducted beforehand; the authors conducted a post-hoc power calculation for the smallest interaction effect, resulting in a power of 0.8. The scales risk and knowledge shared a low internal consistency. The risk scale might suffer from a basement effect and knowledge and intention scales at post-test might show ceiling effects. One of the three schools in the control group did not complete the post-test on day five but on day four due to school internal reasons. Different measurement intervals bear the risk of influencing the observed outcomes. However, regarding risk-score, knowledge-score, and intention-score no differences between the four-day and the five-day measurement interval could be found. The study lacks a follow-up, which limits the explanatory power. Since the main focus of the curriculum was to promote awareness and intention, a change of behavior over the long term was not evaluated. Social-cognitive determinants of intention-building have not been assessed, thus limiting our ability to test for further mediating effects. The BSAC program was effective in raising awareness about cancer and its associated risk factors as well as health-promoting intentions. Since an integration of these topics into the official school curriculum is difficult, this project is one option to impart cancer knowledge in this age group. The results indicate that the effectiveness of BSAC is independent of the students’ risk profile and can therefore be implemented as a suitable program raising cancer awareness and health-promoting intentions. Friederike Stölzel, Nadja Seidel contributed equally to this work. This study was supported by Deutsche Krebshilfe e.V. (German Cancer Aid) in the Program for the ‘Development of Interdisciplinary Oncology Centers of Excellence in Germany’, reference number: 107759. We furthermore acknowledge the support by the German Research Foundation and the Open Access Publication Funds of the TU Dresden. We would like to thank all principals, teachers, pupils and their parents participating in our research. In addition, we appreciated statistical supervision by Anke Rentsch as well as feedback about design and content of the BSAC program from Gunnar Folprecht, Steffen Pistorius, Daniel Zips, Beate Hornemann, and Monique Simon (University Cancer Center Dresden). We also express deep appreciation to Kenan Onel (University of Chicago Medicine) and Friedrich Stoelzel (University Hospital Dresden) for language editing. FS participated in the design and carried out the study. NS performed the statistical analysis. FS and NS drafted the manuscript. SU participated in the design and helped in the data analysis. MB, HB, JH and GE provided advice in the design of the study and contributed to the manuscript revision. GE is head of the project. All authors read and approved the final manuscript.